Artificial Afterlife speculates on connections between technology and spiritual belief systems. The work visualises the energy stored in the fluids of a dead duck. Here technology is able to capture a sign of life, even though we know the bird is dead. What is the role of technology in this system, and how are we defining life? Artificial Afterlife (2016) tells a personal interpretation regarding spiritual phenomena. 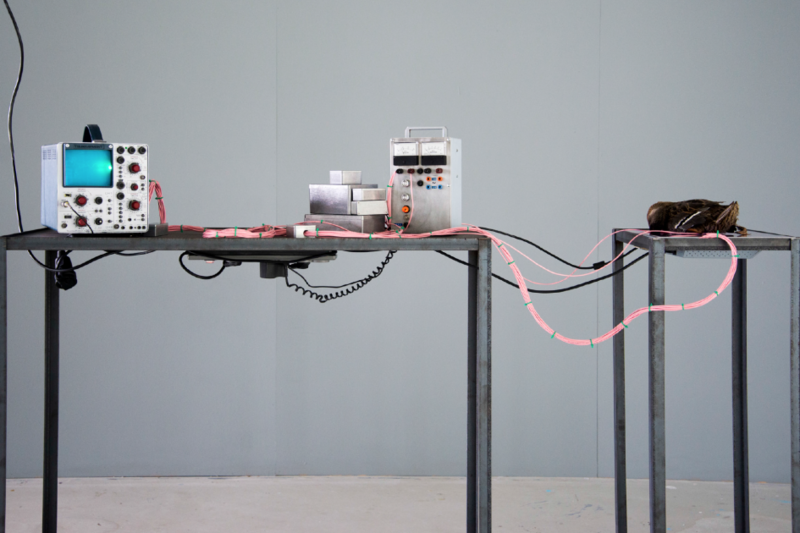 Additionally, the installation focusses on mystifying technology, using exposed wires, apparatus and sockets physically connected with the dead. Inspired by galvanism and the famous novel Frankenstein, an analogue electronic circuit was created using deceased animals as an energy source. The deceased animal (donated by a local animal rescue center) is the circuit’s key, generating red and blue visuals on a monitor screen. Without this source, the monitor will not be powered nor will it produce any visuals. With this set-up I am trying to introduce a combination of opposite theories: technology and spirituality. Amy Whittle is an interaction designer with a fascination for data, prints, video, products and installations focusing on interactivity. Her work can be considered either art, design or a combination of the two, intertwining different and non artistic disciplines to projects based on technology, biology and history. In a growing society where people are becoming more familiar with the computer she’s striving to find a balance between two technical disciplines: the mechanical and the computerised.